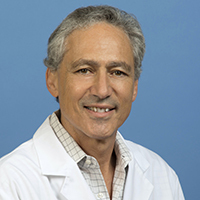 Jeff Bronstein received his bachelor's degree from the University of California, Berkeley and M.D. and Ph.D. from UCLA as a recipient of the Medical Scientist Training Program Award. He completed a residency in Neurology and fellowship training in Movement Disorders at UCLA. Dr. Bronstein also completed a postdoctoral fellowship in molecular biology before being appointed an Assistant Professor of Neurology. He was later appointed Director of the Movement Disorders Program at UCLA. His interests and expertise include the management of Parkinson's disease (PD) and other movement disorders, surgical treatment of PD, and developing new therapies for patients. Dr. Bronstein was recently awarded one of 6 National Parkinson's Disease Centers at the Veterans Administration Medical Center with the goal of furthering research, education and clinical care in the Southwest US. His laboratory studies the cause of PD using cell models and a newly developed zebrafish model. His work supported by the NIH and private foundations. Dr. Bronstein also directs clinical trials in order to develop new therapies for PD that include transplantation and deep brain stimulation. He has received several awards and is widely published in the field.